At The Evesham Hotel, enjoy a satisfying meal at the restaurant. Wrap up your day with a drink at the bar/lounge. A complimentary full breakfast is served daily from 7 AM to 9:30 AM. Near the western fringe of the Cotswolds Area of Outstanding Natural Beauty, Evesham is a quintessential English riverside town that was one of the leading monastic centres in Europe for much of the Middle Ages. The town is the home of the Evesham Arts Centre, which celebrated its 30th anniversary in 2009 and organises regular music performances, theatre events and other amateur and professional shows. This striking landmark was built more than 1,300 years ago, although, as you might expect, it has been altered on multiple occasions over the centuries, most notably after the Dissolution of the Monasteries in the 16th century. However, the abbey remains Evesham's defining landmark, and still contains its original 8th-century bell tower. See the beautifully preserved 15th-century Merchant's House and, if you have the time, visit the town's fantastic Charter Market, which takes place every Saturday. In fact, a market has been held at this site since the mid-11th century, when the town received permission to host one by none other than King Edward. At 320 metres, the Broadwater Tower is the one of the highest point in the Cotswolds. It commands wonderful panoramic views over the lush countryside of Worcestershire and Gloucestershire, and, on days with very good visibility, thirteen other counties. The landmark, which is a folly and was built towards the end of the 18th century, was pioneered by the famous landscaper Lancelot 'Capability' Brown, who designed the grounds of many famous British stately homes. 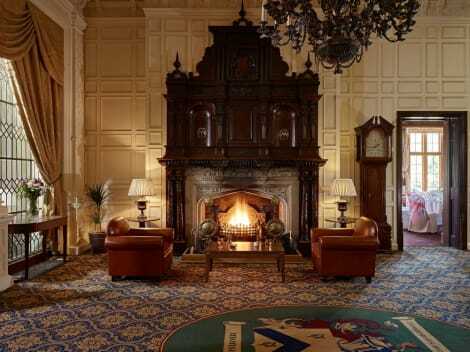 Book a room at the historic Evesham Hotel for great hospitality and beautiful furnishings, or consider the opulent Wood Norton Hotel or the elegant Northwick Hotel. For great value-for-money Evesham hotels, you can book a stay at the Premier Inn Evesham or choose the affordable, charming Brookside Guest House. There's nothing quite like an authentic country inn experience, and if you're after some delicious British classics, head to The Royal Oak or the The Trumpet Inn. For some fantastic Bangladeshi cuisine, dine at the Evesham Balti restaurant, enjoy vibrant Thai dishes at Thai Lotus, or treat yourself to some delightful Chinese cuisine at the River Avon restaurant.